Senator the Honourable Allyson West was appointed Minister in the Ministry of Finance on June 30th 2017. Senator West is a former Partner and Territory Tax Leader in the Tax and Corporate Services Department of PricewaterhouseCoopers (PWC), Trinidad and Tobago (T&T). She is a senior member of the Law Association of T&T, registered to practice law in T&T. Senator West has been involved in providing a full range of taxation advice and assistance to clients of PWC and she has been an integral part of many multi-disciplinary teams engaged in tax planning, structuring and advising on various financing transactions and corporate restructurings. 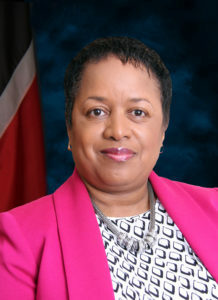 Further, Senator West has successfully represented clients in discussions with taxation authorities throughout the region on various tax issues, made presentations to Judges of the Supreme Court of T&T, members of the legal profession, various business organisations, and members of the public on a wide range of topics. Senator West previously served as a Senior State Counsel at the Board of Inland Revenue (BIR) from 1986 – 1994 and was responsible for advising the BIR on taxation, legal and regulatory issues. During her employment at the BIR, the Senator gained extensive experience in the definition and implementation of taxation policies and supporting regulatory frameworks for the Government of T&T. She was the legal representative on the team established by the Government in 1989 to implement a Value Added Tax system in T&T and in that role assisted in formulating policy, liaising with the legal draftsman to ensure the accurate translation of policy into legislation. She was also integral in drafting position papers for the Minister of Finance, attending Parliamentary sessions to assist with any questions which may have been raised on the system and the legislation and handling various other issues related to the implementation of the new tax. Senator West also served as a member of T&T’s Permanent Double Taxation and Negotiating Teams for the conclusion of Double Taxation Treaties and represented the Government of T&T and the Board of Inland Revenue in contract negotiations and at numerous regional and international conferences. She has also represented the BIR in numerous tax appeals and various other matters before the Courts of T&T.